Followers of 365 days of Orchids will have noticed that we are big fans of orchids belonging to the pleurothalidinae – orchids from the tropical americas such as plants from the genera masdevallia, pleurothallis, restrepia and trisitella – many of which have small but fascinating flowers. This species could not be accused of having small flowers. 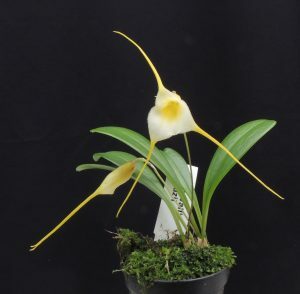 Masdevallia tonduzii is a small growing Masdevallia with very large flowers . 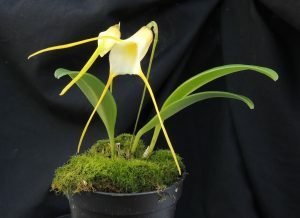 The plant shown here is in a 3cm pot and so the leaves are 5cm long and the flowers 12cm across including the tails. The species is native to Costa Rica and Panama where it grows in forests from 400-1400m altitude making this a bit warmer growing than most of our cloud forest Masdevallia species. The inside of the flower is hairy adding further to the the brilliance of this little species . The species is named after Adolphe Tonduz a Swiss naturalist who was invited to Costa Rica as part of a drive for education and science in the country in the 1880s. He contributed greatly to knowledge of the amazing plant diversity of Costa Rica between 1889 and 1920 but sadly died an alcoholic aged 59. If you would like to know more about his life and work there is a great article about him. We grow the species in Cool Americas during the summer but move it to the warmer and dryer ‘classroom’ section for the winter as the species comes from a lower altitude than most of our masdevallias. (The classroom section is also full of plants of course). We have this photo of the plant 12 months ago which shows that it is growing well with 5 leaves compared to last years 3.